Many of you are aware that my daughter is autistic. Her vocabulary is extremely limited; she has developmental delays. Like any person she has her good days and not so good days. The challenge she faces every day is that of being (mis) understood. Can you imagine what it must be like to try and express yourself only to have people stare at you, get frustrated with you and even walk away from you? This is what my daughter often experiences every day. The world must be such a confusing place for her. That said, there are also people who have been able to get to know her by providing her various types of services. Our Mija allows them into a world that most people never see. One of these people is my friend and hairdresser, Katja. My daughter and Katja have developed a special relationship. 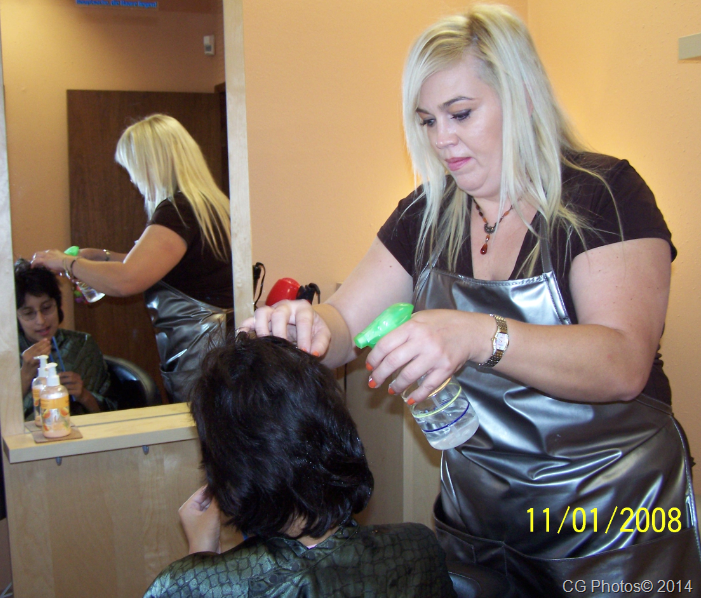 Katja regularly gives her haircuts, pedicures and manicures! Our daughter sits reasonably still for Katja while having her hair cut, November 2008. Her manicures and pedicures originally started with Janie. She and Katja shared the same salon space. When Janie moved out of town, Katja continued where Janie left off, making sure that our daughter received proper grooming, along with some pampering! Our daughter inspects Janie’s work while having a pedicure, November 2008. 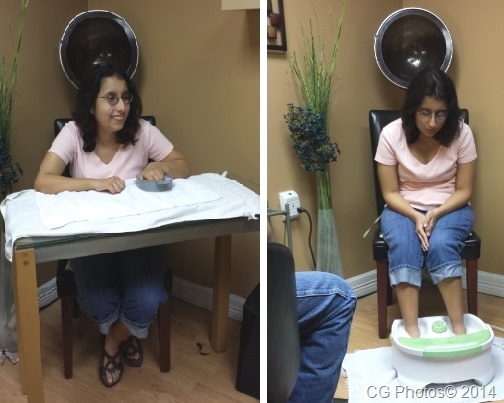 Taking her to the salon has provided her with the opportunity to be social, not an easy task for those with autism. Over time she’s gained patience as her fingers soak in a little bowl of water. She inspects each fingernail as soon as it’s clipped, then returns her hand to the suds. Her pedicures are a bit more challenging, but she is gaining patience with these as well. Mija relaxes while her fingers, and then her feet soak in sudsy water. She’s known Katja for over twelve years now. All these years Katja has been patient with her, telling her that she’s doing well, that she’s almost done, oh, and would she like some lotion? Well, recently Al took her to her appointment. 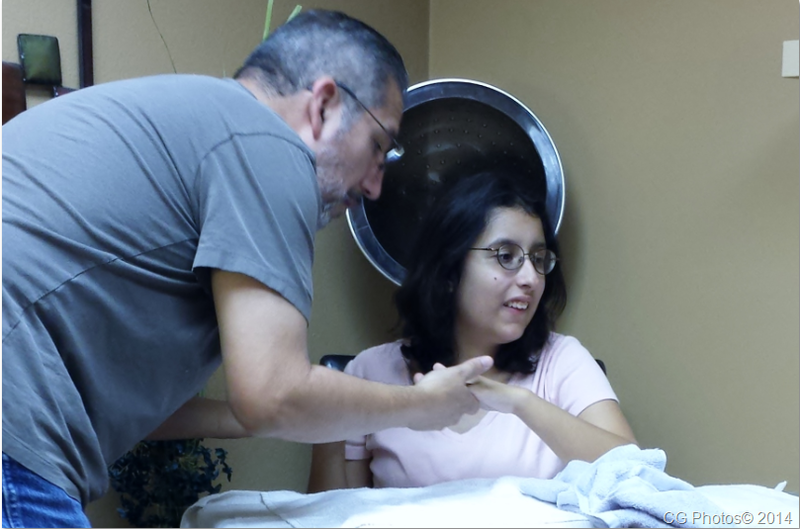 Al reassures Mija while she waits for her nails to be done. Katja expressed it in a recent on-line post. I’ve edited it slightly, but here are her words. PRAISE GOD!!!!!! Miracles DO happen!!!! Yesterday was as one of the best days I ever had, and I feel the need to share it with all of you. Unfortunately, I was too emotional to write about the miracle I witnessed yesterday, as I could not stop crying (tears of joy). You see, about 12 years ago, I met a special little girl. We have developed a unique and special relationship that started from hair cutting, to manicures and pedicures throughout the years. Mija and Katja enjoy their time together. And although my special little girl is now 18 years old, she has never spoken a word to me, thus letting me know through her own way of communication, that she enjoys our beauty visits as much as I do. As I finished her pedicure yesterday, and thanked her for her cooperation for letting me do my job without her dad’s help, I praised her. She talked to me for the first time!!!! Al and I almost fell out of our chairs; and we were overcome with emotions. I had to ask if he had heard what I heard, and it was not just my imagination that I wanted to hear her talk to me. I wondered for 12 years if our special relationship means as much to her as it means to me…and as I heard her speaking to me for the first time, I now know what I always hoped. She does enjoy our relationship!!!! Katja reassures Mija that her pedicure won’t hurt. It will be fun! Thank you Jesus! What a miracle! I feel so honored to be trusted with her, and blessed to have her in my life. A single word was uttered. Even though she doesn’t understand this, its utterance meant that for this one moment our daughter took the initiative to break out of her world to reach out to someone that she knows. Will this ever happen again? We don’t know. But there is one thing we have always known, and this moment proved it. Our daughter enjoys herself while she gets pampered! Our daughter truly has a voice. 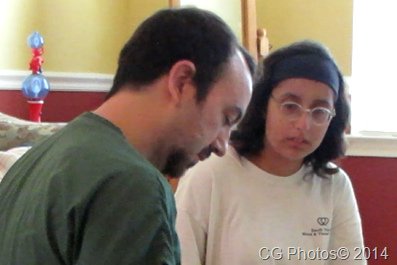 p. s. We owe a tremendous debt of gratitude to Alex, our daughter’s speech therapist. He is another person our daughter has allowed into her world. We love to share stories of our daughter’s vocal experiences with him. This is really a topic for a separate post, so stay tuned for more! 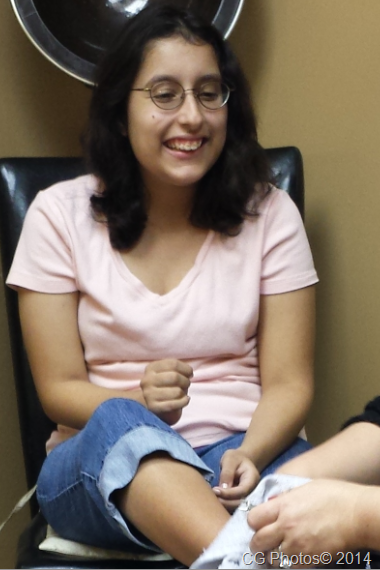 Many thanks to Alex, our daughter’s speech therapist! More about this in a future post! God bless you and your beautiful daughter now and always. This is such a beautiful story and it literally brought me to tears. 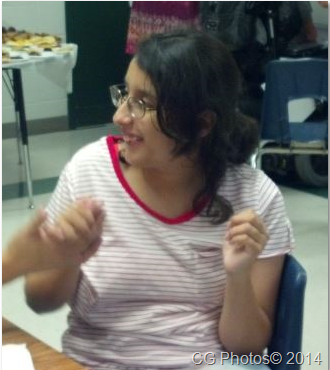 Loved this story of Mija! What a blessing!!! Thanks, Terry. She has lots of limits but in her own way she is quite amazing! Hi Patty. I have been so touched by these comments. We are very fortunate that people have come into our lives who have opened their hearts to our family. It reminds me that I need to be sharing these types of stories…my daughter is an amazing teacher. It’s humbling to see what she can bring to people who are willing to open their hearts to her. 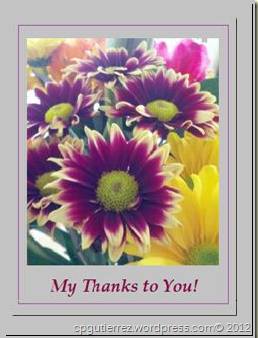 Thanks for much for you comment and for stopping by! She is indeed special as is her mother!